This is one of John McPhee's extended profiles (The Headmaster, Oranges, etc.) guessably of New Yorker derivation. 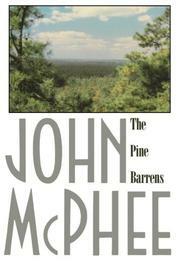 The Barrens from little needles extend far beyond the 1000 square miles they cover halfway across New Jersey. It's primarily iron and blueberry country and its rather reclusive, if not inbred, people are often called "pincys"--a soubriquet they resent from outsiders which has its stigma of degeneracy. McPhee, sometimes in the company of two old timers, covers the region, its historical and geo-topographical features, its principal community-Chatsworth (300 people), its outstanding recent incidents-a plane crash, the 1954 fire, and a native's return as an Italian prince.... All in all, enlivened facts, some well remembered events, and the customary pleasant softshoe styling.